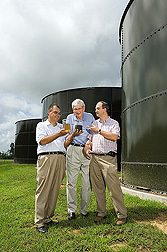 ARS soil scientists Matias Vanotti (left) and Ariel Szogi (right) and Lewis Fetterman, the CEO of Terra Blue, Inc., examine swine wastewater before (dark liquid) and after (clear liquid) treatment in the second-generation system they invented. 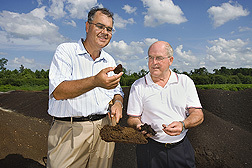 For almost 10 years, Agricultural Research Service (ARS) soil scientists Matias Vanotti and Ariel Szogi have worked with farmers, state agencies, and businesses to improve swine manure management practices. Now the scientists have developed a streamlined system that delivers a winning trifecta—healthier pigs, healthier profits, and a healthier environment. A key factor in this success? “We paid lots of attention to what farmers and industry were telling us,” says Vanotti, who works with Szogi at the ARS Coastal Plains Soil, Water, and Plant Research Center in Florence, South Carolina. Manure can be used to fertilize crops, but excess nitrogen and phosphorus that is not taken up by plants can be carried away by water and end up polluting nearby streams, lakes, and groundwater. Controlling pathogens, odors, and emissions of ammonia and greenhouse gases is also a concern with livestock production. So swine producers in North Carolina—who in 2008 sent close to 20 million pigs to market—are always on the lookout for ways to reduce the environmental impact of their facilities. When Vanotti and Szogi started out, the technology available to them resulted in a highly effective first-generation treatment system. But the results from their farm-scale trials and new discoveries suggested that they could design an even more economical and simple process. 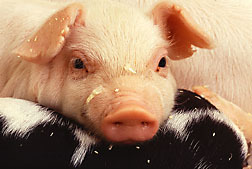 Close-up of piglet and sow. An added incentive: In 2007, the State of North Carolina started a statewide Lagoon Conversion Program (LCP) that provided financial support to livestock farmers who installed new manure management technologies that improved water and air quality. The LCP set clearly defined targets for techniques that would meet their criteria of an Environmentally Superior Technology (EST) for manure management. An EST needed to eliminate discharge of animal waste to surface waters and groundwater. It also needed to “substantially eliminate” emissions of ammonia and odors detectable beyond the production facility. An EST would also substantially eliminate the release of disease-transmitting vectors and pathogens as well as nutrient and heavy metal contamination of soil and groundwater. And an EST would need to run economically and efficiently. The scientists’ system already met the environmental targets. “We needed to demonstrate that we could cut costs while maintaining the efficiency of the first-generation system,” Szogi says. So Vanotti and Szogi went back to the drawing table and worked with Lewis Fetterman, the chief executive officer of Terra Blue, Inc., to redesign and fine-tune the process. In the end, the team made 24 changes to the first-generation system to lower its installation and operating costs and improve its reliability. A U.S. Patent was granted for this new system (U.S. Patent 7,674,379, March 9, 2010). The on-farm system used solid-liquid separation and nitrogen and phosphorus removal processes. In the right combination, these systems replaced traditional anaerobic lagoon systems with a process that produced clean, deodorized, and disinfected effluent. After processing, the nutrient-rich solids were transported off-site to a central composting facility that produced class A composted materials for making organic plant fertilizer and plant growth media. The team reduced the solid-liquid separation operation from 7 days a week to just 2. Several other adjustments were also made to this process, including simplifying the equipment used in the dewatering process and the production of drier solids. This improved solids handling, lowered transportation costs, and made the solids more suitable for composting. It also increased their potential for use as fuel for on-farm energy generation by thermal technologies. To cut costs further, Vanotti and Szogi removed two tanks from the biological nitrogen removal process and incorporated a high-performing nitrifying bacterial sludge (HPNS), which they developed over 10 years in the laboratory. The new HPNS was well adapted to operate efficiently in both high-ammonia wastewater and cold temperatures, which translated into a smaller plant footprint. It also reduced the cost of ammonia removal. 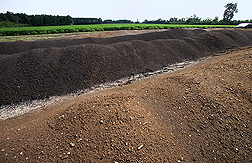 After processing, the nutrient-rich solids are transported off-site to a centralized composting facility. The composting process results in materials with an earthy scent and rich texture that can be used in organic fertilizers, soil amendments, and potting soils. A U.S. Patent Application was filed for the HPNS (Serial No. 12/495,958, July 1, 2009). Finally, the scientists invented a simplified process to simultaneously separate the phosphorus and the manure solids. This innovation required fewer polymers than the previous separation system and also reduced equipment costs. The revamped system was tested for 15 months on a 5,145-head swine farm over 4 growing cycles. For this full-scale project, they collaborated with microbiologist Patricia Millner, who works at the ARS Environmental Microbial and Food Safety Laboratory in Beltsville, Maryland, and chemist John Loughrin, who works at the ARS Animal Waste Management Research Unit in Bowling Green, Kentucky. The results: the revamped system met EST standards at one-third the cost of the previous version. In cleaning up manure wastewater, the system removed almost 100 percent of pathogens and odor-causing components, 95 percent of total phosphorus, 97 percent of ammonia, and more than 99 percent of heavy metals copper and zinc. The new system also cut emissions of methane and nitrous oxide—powerful greenhouse gases—by 97 percent. In addition, the system transformed the old lagoon into an aerobic reservoir that reduced 90 percent of the ammonia emissions. The second-generation system used less energy to boot—power consumption dropped by 44 percent. The newer system was also more labor efficient and easier to operate than the first system, in part because of the development of operation practices that integrated automation with simple operator input. All told, the second-generation technology was two-thirds less expensive to build and operate than the first system. What Vanotti and Szogi didn’t anticipate is how well the animals would respond. The scientists and Tyndall were so impressed that they extended the project—originally planned for 5 months—to run for another year and a half to see if the results stayed consistent over five growing cycles. At the end of the study, the scientists tallied up the surprising results. Daily weight gain increased 6.1 percent, and feed conversion improved 5.1 percent. Animal mortality decreased 47 percent, and cull weight was reduced 80 percent. The farmer sold an average of 5,265 pigs per growing cycle, which resulted in a 1,138,247-pound net gain per cycle. Using the second-generation system instead of the lagoon system, the farmer sold 61,400 pounds more hogs—a 5.8 percent increase—per growing cycle. “Participating in the program took my average farm to the top of the field,” Tyndall declares. The scientists attribute the productivity improvement in part to the improved air quality and health conditions in the barns. Since the recycled wastewater was mostly ammonia free, ambient ammonia levels in the barns dropped an average of 75 percent. “Improvement in animal production is important to farmers because that’s their bottom line,” Vanotti says. Fetterman, their Terra Blue, Inc., partner, sees it from another angle. “If you treat the pigs well, they will pay you back,” he says. The second-generation system was discussed in a chapter of “Manufacturing Climate Solutions: Carbon-Reducing Technologies and U.S. Jobs,” published in 2008 by Duke University. The report was commissioned by the AFL-CIO and the Environmental Defense Fund and featured technologies that could help reduce greenhouse gas emissions and create green jobs in the United States. The authors concluded that the second-generation system could help swine-producing states protect existing jobs and keep the door open for future job expansion. In 2009, the USDA Natural Resources Conservation Service’s Environmental Quality Incentives Program began a 5-year initiative with additional funding for North Carolina livestock farmers who participate in the LCP. At the time the program was established, only the second-generation system met all the LCP qualifications for funding, which will pay for up to 90 percent of the costs involved in installing an EST for manure management. “When one considers the many direct and indirect benefits of the cleaner hog-waste technology, farmers and society may not be able to afford not to convert to the new technologies,” Fetterman observes. “We learned our lessons and tried to make a new system as simple to operate and economical as possible,” Vanotti adds. “Now we need to install these systems in a sufficient number of farms to confirm their environmental benefits at a regional scale and to facilitate the development of markets for co-products from recovered manure nutrients.”—By Ann Perry, Agricultural Research Service Information Staff. 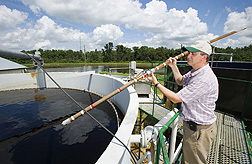 This research is part of Manure and Byproduct Utilization (#206), Water Availability and Watershed Management (#211), and Food Safety (#108), three ARS national programs described at www.nps.ars.usda.gov. Matias B. Vanotti and Ariel A. Szogi are with the USDA-ARS Coastal Plains Soil, Water, and Plant Research Center, 2611 W. Lucas St., Florence, SC 29501-1242; (843) 669-5203, ext. 108 [Vanotti], (843) 669-5203, ext. 109 [Szogi]. "Producers and Pigs Profit From Manure Management Process" was published in the August 2010 issue of Agricultural Research magazine.